This pack is a perfect way to jumpstart any learning environment. It was inspired by the needs of our youngest learners and was designed with Pre-K and Kindergarten students in mind. However, you ’ ll find that it works great for older students, too! The Bluetooth functionality allows for easy software updates and Cubelets programming activities. The Mini Makers Pack supports six groups of learners. Includes 54 SENSE, THINK, and ACT Cubelets, Brick Adapters, storage, and a 5-port battery charger. Save 25% off the retail equivalent price with the Mini Makers Pack! Develop Problem-Solving skills and Computational Thinking. Spark the next generation of innovators by introducing procedural thinking, cause and effect, decomposition of complex tasks, pattern recognition and the ability to notice similarities or common differences, abstraction and algorithm design and the ability to develop a step-by-step strategy for solving a problem, all using Cubelets robots. Cubelets are magnetic robot blocks that can be snapped together to make an end less variety of robots with no programming and no wires. You can build robots that dri ve around on a tabletop, respond to light, sound, and temperature, and have surprisingly lifelike behavior. Endless Possibilities, Endless Fun, Endless Learning. Unlock Your Suden ts ’ Potential, Today! 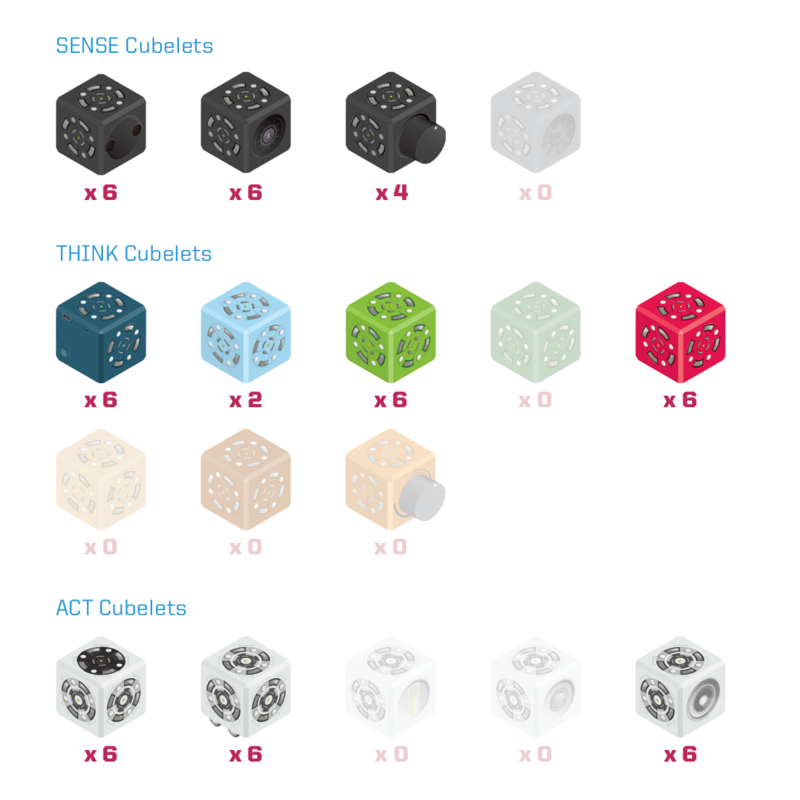 The Cubelets CLASS package comes with 84 magnetic blocks that can be snapped together to make an endless variety of robots with no programming and no wires. Anyone can build robots that drive around on a tabletop, respond to light and other objects, and have surprisingly lifelike behavior. Instead of programming that behavior, you snap the Cubelets together and watch the behavior emerge like with a flock of birds or a swarm of bees. Each Cubelet has a tiny computer inside of it and is a robot in its own right. When you pu t Cubelets together, you're actually making a robot out of several smaller robots. Each Cubelet communicates wi th its neighbors, so you know that if two blocks are next to each other, they're talking. 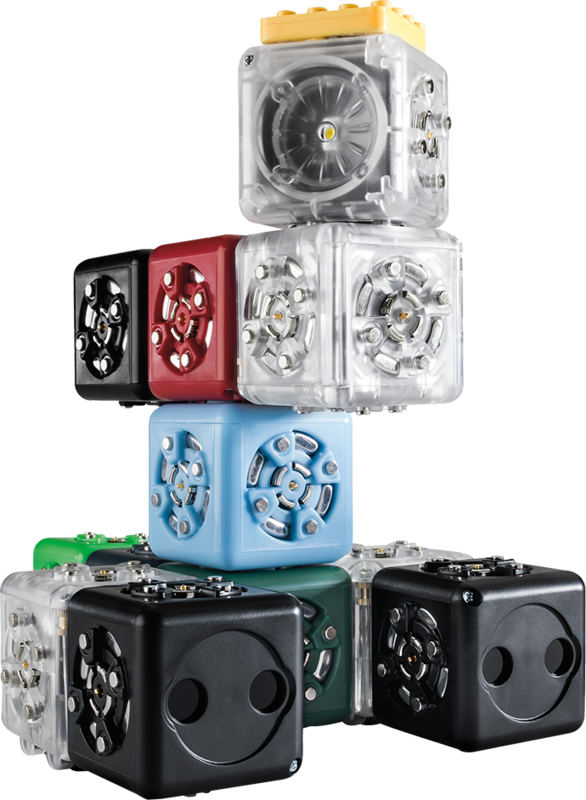 - 54 Cubelets: 6 Battery, 6 Passive, 6 Inverse, 2 Bluetooth, 6 Distance, 6 Brightness, 4 Knob, 6 Drive, 6 Flashlight and 6 Rotate. - Accessories: 24 Brick Adapters (6 sets of 4), 1 5-Port Charger, 5 Charging Cables, and 2 Storage Tubs.